How Much Does It Cost To Water Your Trees? 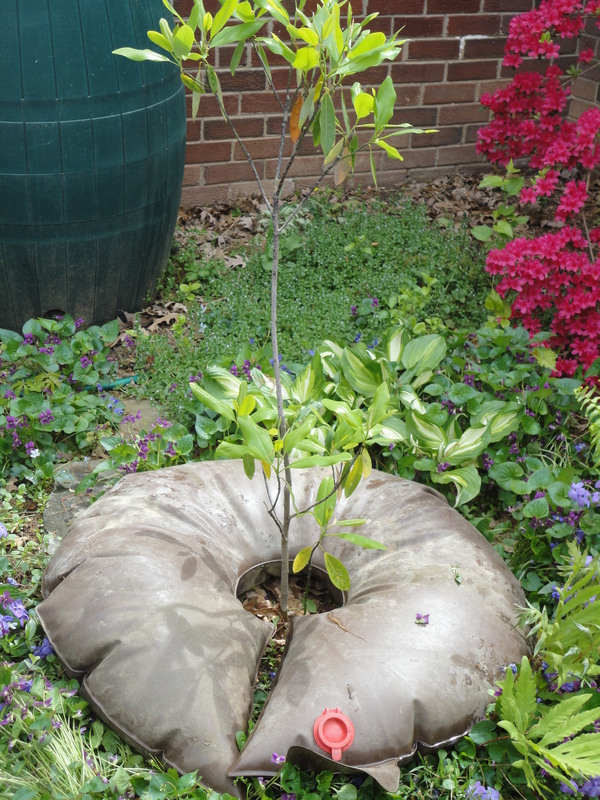 Doughnut shaped water bags provide a wider area for watering, and keep weed wackers far away! My Arlington County Utility bill just came. Since its been so dry this spring, I’ve watered my trees weekly and I’m very interested in what this costs. Both water and sewer fee are charged per 1000 gallons of use, and currently they charge $12.19 for every one thousand gallons of water that comes out my outdoor spigots. A large tree needs twenty gallons of water each week if there is not one inch of rainfall; newly planted saplings may need half as much. I have three large trees, two saplings and eight small shrubs that I would hate to lose to drought. So weeks with no rain, let’s say I use 200 gallons of water, or 1/5 of the cost per 1,000 of $12.19. For me it is a no brainer: less than $2.50 to have shade around my house or buy one more very small espresso weekly? 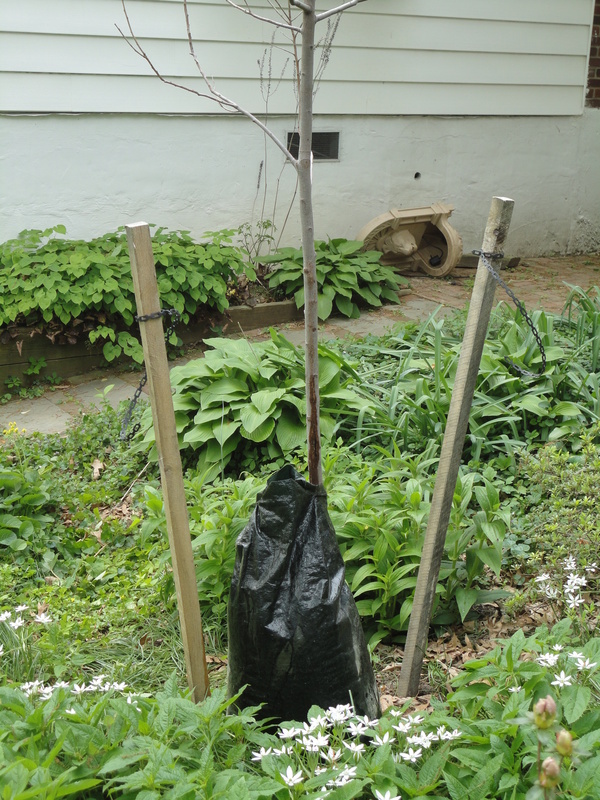 I use watering bags around my young trees because filling up weekly is easy, and my calendar is marked to fill the bags each Sunday. You can buy watering bags at local hardware stores or order on-line. Search for gator bags, ooze tubes, soaker hoses, watering systems and pick the one right for your yard. Upright bags zipper around the tree trunk. All bags need to be filled with water weekly to work. True, it costs more if drought stays the entire summer and I wish to save all my plants. For the last several years, our combined water/sewer bill regularly increases 6,000 gallons which now costs about $75. I will admit that in the summer of 2008, our watering bill jumped by more than $200. We fixed the running toilet immediately. Search the blog for “watering” to learn more techniques to weather the summer. This entry was posted in Education, Tree Care and tagged cost, ooze tubs, watering. Bookmark the permalink.